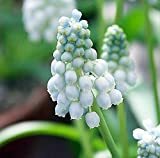 Grape hyacinths for sale – Easy plant to grow, with edible bulbs but mostly grown for the ornamental flowers, planting in early spring or plant the bulbs during autumn, better to buy bulbs or plant, another option to start from the seeds in the autumn yet more challenging. 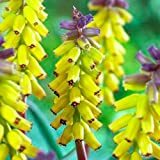 Blooming in the spring in bell shaped flowers that appear in various colors such as blue, purple, white, yellow, pink or mixed colors. Edible part: the bulbs are edible after cooking and can be used for stews and soups.